A couple of dear friends were in town this weekend, and I dragged them around for hours every day showing them interesting things in Los Angeles. These things included standard fare, such as the Griffith Observatory and Sunset Junction, the Natural History Museum at Exposition Park, the double whammy of the Museum of Jurassic Technology and the Center for Land Use Interpretation, and the Bonaventure, our own postmodern icon. We found over time that our meandering, which involved a lot of bus rides and a lot of walking, was greatly enhanced by Bobby bringing his bicycle and playing scout. I happily wander all over my city, finding new bus lines and walks that connect various parts I know, and it can be a doozy dragging friends along on these excursions. The bike scout made it more feasible because he went ahead and checked things out, ensuring that I wasn't leading us all into a food desert or Skid Row after dark. For example, we decided that one round of expensive drinks at the Bonaventure was enough, and that we should head to Little Tokyo for dinner, but we did not know if the restaurant we liked was open on Memorial Day. Bobby rode over and checked it out, while the guests and I trotted along on foot. On a side note, the bird hall at the Natural History Museum has a drawer full of bird heads. And stay away from Tiki Ti on Sunset unless you want to spend $12 on a mix of cheap booze and Kool Aid, all while being aurally assaulted by Steely Dan. See, it's nice having visitors cause you learn new things about your town! Last week, Bike Week, I visited a promotional table UCI's Parking & Transportation Office had set up by the campus bike repair kiosk and was celebrated for my carfree efforts. Really, it was just a table with some granola bars, bottled water (oh, the disconnect! ), a bike raffle, and two staffpeople speaking enthusiastically about biking to UCI. One of them processes my train ticket rebates every month, so she recognized my name. The other, who shares a name with everyone's favorite Marxist critic of LA, fear, and "natural" disasters, I'd spoken to before. We'd chatted a while ago about the relationship between the university and the city of Irvine vis a vis bike paths (there's no signage to indicate how to get from the local train stations to the campus, even though there are off-street paths nearly all the way). I asked about Autopalooza, the car-centered event UCI is hosting for students today, and they told me that it was really a ploy to encourage students to take all possible measures to reduce emissions and increase fuel efficiency. I was glad to hear a rationale. Sadly, I heard from that office again this week when they informed me that OCTA (Orange County Transit Authority) is cutting back on its shuttle routes between the Tustin Metrolink station and UCI. Really, this doesn't impact me so much as makes me worry that it'll be the last straw for other troopers who do that commute and who don't enjoy my bikey flexibility. Each little barrier adds up to making public transpo seem really inconvenient and frustrating. So I'm going to send the Parking & Transportation Office my bike route maps between UCI and the Tustin and Irvine train stations, in hopes that they can let other train riders know that there is, in fact, another option for getting between the train and school. So the campus sent out, via "zotalert," their text messaging alert program, an alarming message announcing this. It didn't declare a lockdown, or recommend that we stay indoors, but merely said that if we saw this individual we should "call 911 immediately." Add to this the sound of a helicopter circling overhead, multiple police on motorcycles riding around the pedestrian areas of campus, and a visible figure on a nearby tall building. My cohort and I decided to stay safe in our locked office rather than venture across campus to the building where we had an afternoon class. The last option proved correct, as it turned out that the "rifle" was just an airsoft gun. Oh good! Just some young man simulating violence, nothing serious! And so all the bro-dawgs got back to ogling young asses hanging out of hotpants in peace. I was saddened to hear that LADOT is considering cutting funding for its bikeways staff. This would be a highly troubling decision for several reasons. First and foremost, many Angelenos ride bicycles to work each day, and already face tremendous struggles crossing our car-dominated landscapes. Bike route signage provides one of the only defenses we have against aggressive drivers. Lest LADOT or the city council be confused about just who is riding bikes in LA, let me speak from my experience starting a campaign to benefit Spanish speaking cyclists. 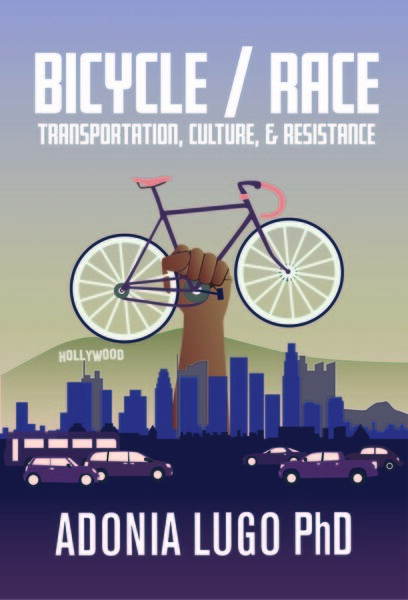 This is not a middle class movement; people of all income levels, including the lowest, ride bikes daily in LA, and it is pitiful that so little has been done to support their commutes while the city and county continue to funnel money into projects that have no future in a world moving toward sustainable transportation options. Eliminating bikeways staff would create even more barriers to cycling for existing bicyclists and for those who might be getting started, and would constitute a significant failure to provide safe passage for bicyclists. Second, remember that Los Angeles faces tremendous criticism across the country and the world for lagging behind on efforts to support progressive policy on pollution reduction, public health, and public space. In a recent New York Times online debate about carfree living in the United States, many commenters expressed skepticism about the feasibility of living without a car in LA. Do you really want to confirm all the negative stereotypes thrown around about Los Angeles? This would be the farthest thing from supporting LA as the “cleanest, greenest big city in the United States,” as has been the mayor’s claimed mission recently. Third, it is devastating that this move would mean a ceasing of efforts to secure Safe Routes to School funding and programming. Right now it is more important than ever to educate future generations about the possibilities of carfree travel, and to throw away educational opportunities like this signals a real disconnect between city and county administrators and the needs of our population. Bicycling improves health and provides a pollution-free mode of travel for all residents; do you want to see programming to support this low-cost, high-benefit mode of transport go down the tubes on your watch? There are seven kittens splitting their time between my apartment and my neighbor’s. Already in a week of fostering them I’ve learned about the challenges cat ownership poses to the carfree lady. My local grocery store just down the block sells itty bitty bags of my preferred cat litter, and in search of a larger bag, plus some kitten formula, I rode over to Silver Lake on Saturday. Pet and Leash carries a wide variety of pet things, and I crammed a huge bag of Feline Pine into my backpack. Then I hoisted it onto my back and took off down Hyperion, hoping that if I rode home fast enough I wouldn’t much notice the 25 pounds on my back. No such luck! I wobbled past the brunchy types pulling in and out of parking spaces on Sunset, and was fairly tired by the time I hit Parkman. Anyway, I made it home and did a bunch of kitten stuff. After the kittens had been handed over to my neighbor for the weekend, I decided to indulge in the American pastime, shopping at Target. I took the subway up to Vermont and Santa Monica and hopped on a 704 toward La Brea. However, when the bus was approaching La Brea, it mysteriously stopped and let us off. When I got out I noticed that there was a helicopter (more common than seagulls here, for serious) buzzing overhead, and a bunch of police hanging around the intersection, shutting me out. Turns out there was a car chase that ended with a suspect at large around the Target area, and the whole plaza was closed. So I wandered around West Hollywood instead of buying an overpriced lampshade. I happened upon my favorite bargain retailer, Ross, and got some summer shoes. Then I shoved my way past the Hollywood and Highland mall complex to get back on the subway. I saw a bunch of lackluster street performers, and not one but two Jack Sparrows on the same block. The second Jack wasn’t even doing much, just standing there, as if he understood that he’d been upstaged by the more charismatic Jack down the block. Then later I tried to go shopping at a Ralph’s but a security guard tried to search my bag, so I went home. Puh-leeze! Sunday was consumed by food. If I wasn’t cleaning the kitchen, I was sorting vegetables for the food co-op’s boxes. I started the day by making up a recipe for cornmeal pancakes, which turned out A-OK, and then rode over to the Hollywood farmer’s market. One of my neighbors at the ecovillage has been a bike messenger like since the dawn of time, and consequently he knows how to get around LA like no one else. He told me about a great way to get to the farmer’s market from K-town. I tell you what, it sure is pleasant riding through wealthy neighborhoods like Larchmont and Hancock Park. They have mature trees! After wallowing in organic apples and delicious lemonade, I strapped a big bag of grapefruits to my bike rack, rather precariously, since it was on top of my backpack crammed with stuff. The strain appears to have done something funky to my front brake, and the bike was so unwieldy that when I got home it toppled over as I was struggling to get my front gate open. But the raw milk was uharmed.